Det. Jack Radcliff has a heck of a wireless package. Somehow, he can place calls to his late niece several days before her violent death. With her help, Radcliff will try to solve and prevent her murder in Jacob Estes’s Blumhouse-produced Relive, which premiered at the 2019 Sundance Film Festival. Radcliff always took a special interest in Ashley, the daughter of his deadbeat brother. Her father had been getting his act together, but lately he has shown signs of back-sliding. Nevertheless, the detective is shocked to discover his brother, sister-in-law, and niece all dead in an apparent murder-suicide. Shortly thereafter, Radcliff receives a call from Ashley that he attributes to stress and grief. However, when Ashley calls back, he has her perform a few minor future-changing exercises that convinces him. It soon becomes clear Radcliff’s brother reverted to his old ways, but he did not kill anyone. Instead, he made the mistake of getting involved with a gang of drug-dealing dirty cops. As Ashley snoops around, she stirs up the suspicions of the cabal in the past and Radcliff draws their attention in the present. It is dangerous for her, but Radcliff does not have much choice, considering she is dead in his time-line, but he still tries to shield her from the grim future. [Relive’s] execution is snappy and the dialogue is crisp. Essentially, Relive is a lot like the 2000 Jim Caviezel movie Frequency and the criminally over-looked indie, Cryptic. It features a similar Macguffin, but Estes & Drew Daywalt’s screenplay is entirely disinterested in offering any sort of fantastical explanations. Instead, it functions more like a procedural, albeit with periodic temporal resets. 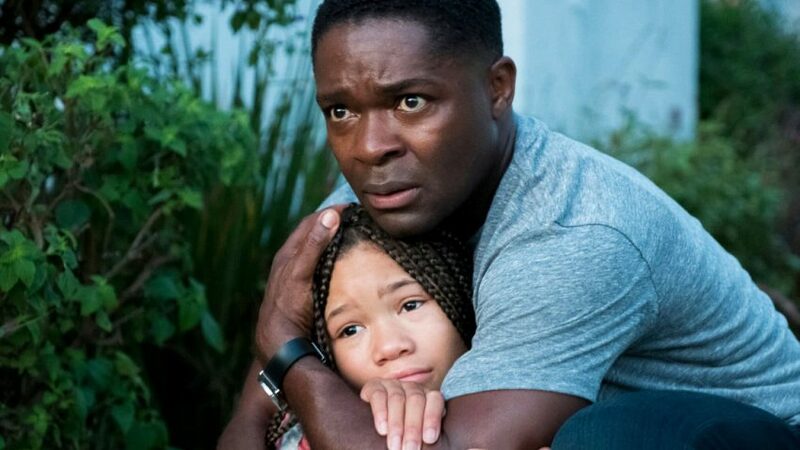 Even if it covers similar ground as those previous films, David Oyelowo elevates the material. For years, publicists and studios have been positioning him for stardom, but it could very well be scrappy Blumhouse that genuinely breaks him out as a leading man. He is terrific as Radcliff—gritty and grounded every step of the way. He also relates well with Storm Reid’s Ashley, in their relatively limited screen time together. As usual, veteran character actors Mykelti Williamson and Alfred Molina add plenty of attitude and energy as Radcliff’s partner and captain, respectively. Arguably, Relive’s most conspicuous shortfall is the supposedly surprise villain, who is so obvious, he might as well wear a baseball cap that says “bad guy.” On the other hand, Estes’s sparing use of time ripples mostly keeps him honest when dropping plot twists and sudden revelations. His execution is snappy and the dialogue is crisp. Recommended for fans of time-warping mystery-thriller hybrids, Relive screens as part of this year’s Sundance Film Festival.